Proper functioning of the compost also requires that suitable bedding is used. 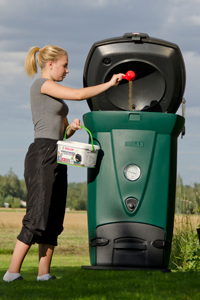 It keeps the compost airy and absorbs odours and excessive moist. When composting garden waste, which is poor in nutrients, it may become necessary to add nutrients among the waste. By chopping or chipping the branches in your yad you can get excellent bedding for the compost. The chips keep the compost very airy. Brach chips generates plenty of organic matter, which makes the compost to a soil conditioner with a long-lasting effect. Raking waste is good for compost bedding provided that it contains coarse material, such as tree needles, hay, moss etc. Also tree needle litter from forest paths makes an excellent bedding. has too fine consistence as such. Mix it with coarser bedding. efficiently absorbs excessive moist and odours. The smell of ammonia can be eliminated using sour peat. The peat used in compost should be as coarse as possible, non-fertilized and non-limed. As such the peat packs up too much and, therefore, it pays to mix it with, for example, branch chips or cutted chips. Make sure the peat is quite dry so that it will not freeze in the bedding container in winter. is the dried and crushed bark of coniferous trees. It makes a good bedding that combines the ability to absorb odours of the peat and the airy consistency of chips. It is used in particular in toilets, but also in the household waste composts. Biolan Komposti and Huussi Dry Bedding is a ready-for-use bedding made of dried and milled bark and peat. can be used as bedding, if it still contains non-decomposed coarse substance.